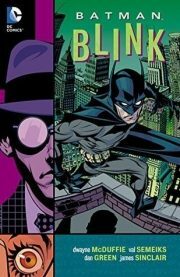 Dwayne McDuffie’s 2015 volume, Batman: Blink, collects Legends of the Dark Knight issues #156-158 and #164-167, which were first published in 2002–2003. To put it another way, he has put together two related story lines: Blink and its sequel, Don’t Blink. Women are being killed in horrific ways. But aside from the ugly nature of their deaths, there seems to be nothing that explains why these women were targeted or who has been targeting them. At least nothing that the police or Batman can see. Lee Hyland is the only surviving witness and the cops don’t expect he will be a useful one. Not because Lee is a career criminal—he has been careful to keep that a secret—but because Lee is blind.